Rich Haverfield, Vice President, became a Rich & Cartmill, Inc. shareholder in January 2000. 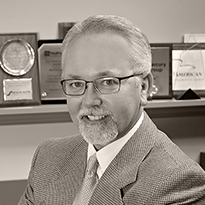 He joined the firm in 1993 as a sales associate, after 10 years with Federated Insurance Company in Tulsa. At Federated he was a commercial insurance marketing representative, serving as district manager from 1986 until becoming senior representative in 1989. Rich is a member of the Independent Insurance Agents of Greater Tulsa and the Oklahoma Association of Insurance Agents. He received his CIC designation in 1994, and obtained his CPCU designation in 1999. A native of western Kansas, he received his Bachelor of Science degree in Business Administration from Fort Hays State University. He and his family are members of St. Clement of Rome Catholic Church. His leisure-time interests include golf, fishing and family activities.